We have already mentioned the absolute necessity of preparation and organisation in regards to preparing shot lists and floor plans. But on the actual day of filming one of the most important documents you can have is a call sheet. A call sheet is essentially a document issued to cast and crew with information they will need for that specific day of filming. Most importantly it lists the 'call times' -that is the times that they are expected to arrive or be on set. It is normally issued at least several days before filming so that everyone can be well prepared for all eventualities. Call times. In this case it shows general call times for both cast and crew. 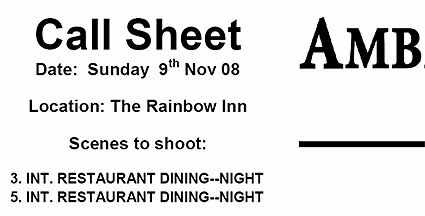 However it is often good to prepare specific individual call sheets especially if the cast are only required for certain times of the shoot. Specific contact information including names, telephone numbers and e-mail addresses where possible.